British Cycling describes track cycling as ‘all about speed, stamina, technique, tactics and nerve’. Track racing takes place on indoor and outdoor oval tracks usually made of wood, tarmac or concrete and ranging from less than 200 to over 400 metres long. Tracks are banked to varying degrees to enable riders to maintain high speeds. the outdoor Lyme Valley Stadium in Newcastle-under-Lyme. 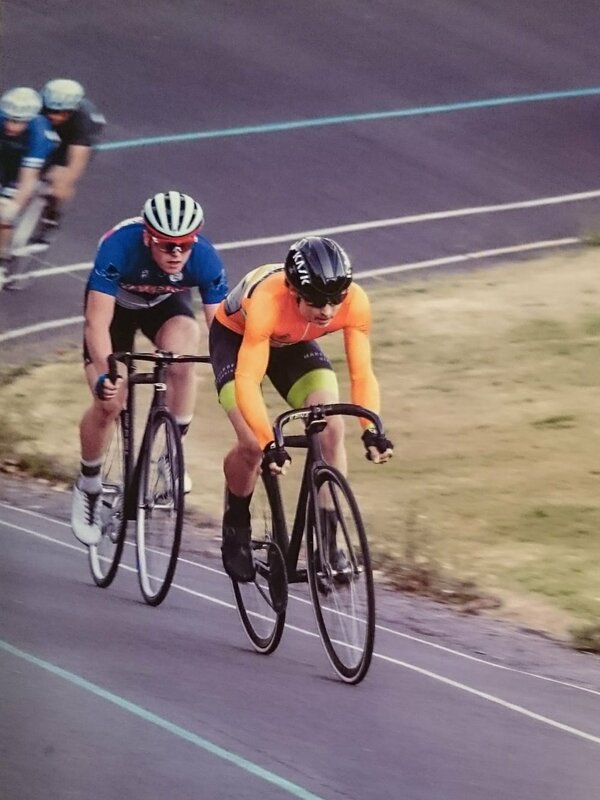 Track bikes are minimalist: no brakes and just one ‘fixed’ gear. If the back wheel is turning, so are the pedals. Choosing what sized gear to ride depends on the event and your strengths, weaknesses and tactics. A bigger gear will take you further for each pedal turn but will be slower to accelerate and harder to spin with tired legs. Rotating spokes create turbulence and drag, so a disc wheel will always be faster once you’re up to rolling speed. But they can be heavier and slower to accelerate so, in events that require changes of pace, riders may use a disc on the rear only. Track racers need excellent fitness, usually expressed as a high VO2 Max measurement which indicates their ability to use oxygen efficiently. Sprinters tend to be muscular and able to generate massive power for short distances while endurance riders are lighter and more suited to maintaining high speeds over longer distances. Track disciplines are broadly classified into sprint and endurance events. A head-to-head contest between two riders over three laps, this event captures the essence of track cycling. It’s is highly tactical, with riders trying to manoeuvre one other into an unfavourable position for the first 600 to 700 metres, before launching an explosive sprint for the line. This is probably the most painful of track disciplines, with men racing against the clock for 1000 metres and women for 500. The team sprint is a team time trial for three riders over three laps for men, and two riders over two laps for women. At the end of each lap the front rider leaves the track until only one remains. The Keirin is an event for 6 to 8 riders. Riders start by jostling for position following a motorbike, called a derny, which paces them from 25 km/h up to 45 km/h over five and a half laps. Then the derny leaves the track and the race is on for the remaining two and a half laps. This is considered an endurance track event, although the speeds are still extremely high. Two riders start on opposite sides of the track and pursue each other for 4000 metres (men) or 3000 metres (women) with the winner being the first across the line. The team pursuit involves high speed and clockwork precision, with teams of four riding just centimetres behind each other. Two teams start on opposite sides of the track and try to set the fastest time over 4000 metres, with the time taken on the third rider across the line. Named after New York’s Madison Square Garden where the event was first held, the Madison is a relay event for teams of two riders who race for points at intermediate sprints over 50 kilometres (men) or 30 kilometres (women). All teams race at the same time with one rider in each always active, while their partner continues to ride round, but is effectively resting at the top of the track. When the active rider needs a breather, around every lap and a half or so, they 'hand-sling' their partner into the action. This is a bunch event for individual riders over a set distance with points available for lapping the field and for the first four riders across the line at intermediate sprints. This is one of the most physically and mentally demanding of the track disciplines, with speed, stamina, technical skill and tactical awareness all required. The scratch race is the closest the track has to a road race, with riders simply racing over a set distance and competing to be first across the line. The Omnium consists of four events: a scratch race, points race, elimination race and tempo race. The first two follow the same format as their individual events while the elimination race, also known as ‘the devil takes the hindmost’, puts the entire field on the track. From the second lap, the last rider crossing the line must leave the track until two riders sprint for the victory. The tempo race is a bunch race over 10km (men) or 7.5km (women), with a point available for the rider winning a sprint on each lap after the first four laps. To race on an indoor track you need to be accredited, which means taking part in a series of track sessions to ensure that you are safe. 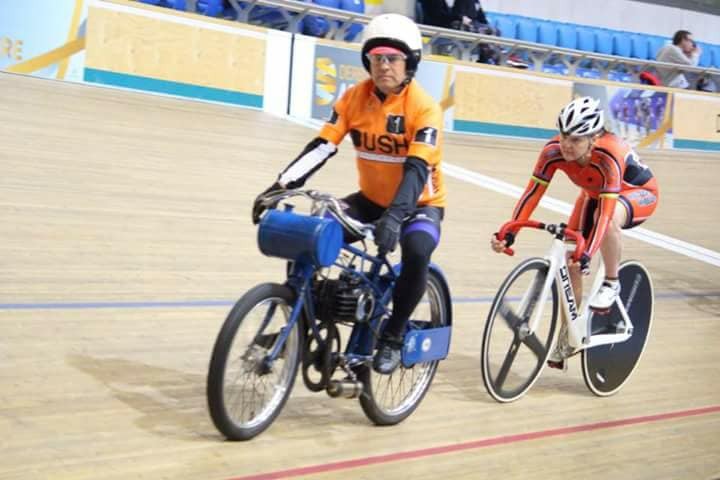 You can do this at the National Cycling Centre in Manchester or the Derby Arena and you will get UK Track Accreditation written on your race licence. Once you’re accredited your next step will be to enter a track league, where you’ll experience different types of races and learn tactically. 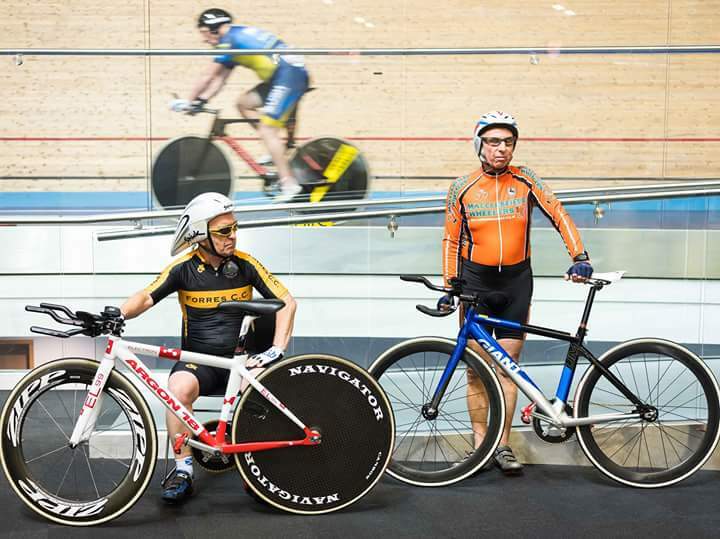 the Manchester Regional Track League runs events for more experienced racers on Friday evenings from October to March. Both these leagues book up fast so you have to get in early. For example, if you wanted to start racing in January, you would have to contact the organiser in October. At Lyme Valley the Brooks Cycles Track League runs events on Thursday evenings from early May until the end of August.